The Oly Mountain Boys | Pacific Northwest Bluegrass | Blog : White Horse update & new venues! 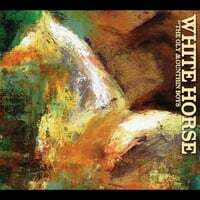 White Horse update & new venues! - All 18 tracks that make up White Horse are mixed and mastered. - We've received all the writing contributions, obtained licenses for the historical photos, and received 5 paintings that will be featured in the booklet that tells Charlie's life story. - We've begun graphic design layout with Euphoria Tea Productions. - We're getting ready to print t-shirts! If you pledged, make sure to check your inbox or login to Kickstarter and respond to the backer survey sent last week. This is how we'll collect the information we need to get you your rewards! We were honored to be a part of what became the opening show at an exciting new Olympia music venue, Rhythm and Rye! With the help of Hillstomp, the place was packed on opening night (unfortunately for the dozens of people who couldn't make it in the door!) Formerly the Royal Lounge, Rhythm and Rye will be hosting a full variety of high quality music nearly every night of the week, so go and check it out! And especially make sure to be there on Artswalk Saturday (April 26th), when we'll be bringing nonstop bluegrass all night with the help of the Blackberry Bushes! Another exciting new venue for us - Jeremy's Farm to Table in Chehalis! They're hosting a lot of great bands, and we'll be there April 12th!